Buy weakness on Chevron and Exxon Mobil given strong technical momentum and solid dividends. .
Oil giants Chevron Corp. (CVX - Get Report) and Exxon Mobil Corp. (XOM - Get Report) are components of the Dow Jones Industrial Average and are members of the "Dogs of the Dow" for 2019. Both are outperforming the average with year-to-date gains of 15.7% and 19.9%, respectively, vs. 11.3% for the average. Exxon is the second-cheapest stock in the average with a dividend yield of 4.25%. Chevron is in fourth place with a dividend yield of 3.85%. Gains in Chevron and Exxon have been helped by the bull market for Nymex crude oil futures. Oil closed Thursday, March 21, at $59.87, up 31.8% so far in 2019 and in bull market territory 38.3% above its Dec. 24 low of $43.30 per barrel. Chevron closed Thursday at $125.86 up 15.7% year to date and in bull market territory 25.6% above its Dec. 26 low of $100.22. Exxon closed Thursday at $81.79, up 19.9% year to date and in bull market territory 26.5% above its Dec. 26 low of $64.65. Oil and energy stocks have overbought weekly stochastic readings. 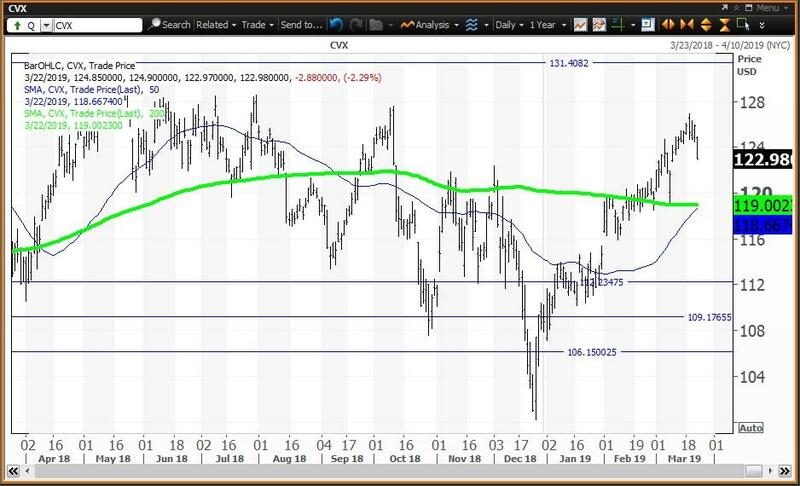 The daily chart shows that Chevron set its 2019 high of $126.92 on March 19. Note that the stock is about to confirm a "golden cross," where the 50-day simple moving average rises above the 200-day simple moving average, indicating that higher prices are likely. Note how the 2019 rally began with a "key reversal" day on Dec. 26 when the low of $100.22 occurred. The Dec. 26 close was $107.39 well above the Dec. 24 high of $104.15 confirming the tradeable bottom. The Dec. 31 close of $108.79 was an important input to my proprietary analytics. This resulted in a semiannual value level at $106.15, a quarterly pivot at $112.24 and an annual risky level at $131.43. The close of $119.58 on Feb. 28 was an input to my analytics and generated a monthly value level at $109.17. Note how the quarterly pivot at $112.24 was a magnet between Jan. 7 and Jan. 30 and thus a level at which to buy, given the dividend, and in anticipation of a positive earnings report that was confirmed on Feb. 1. 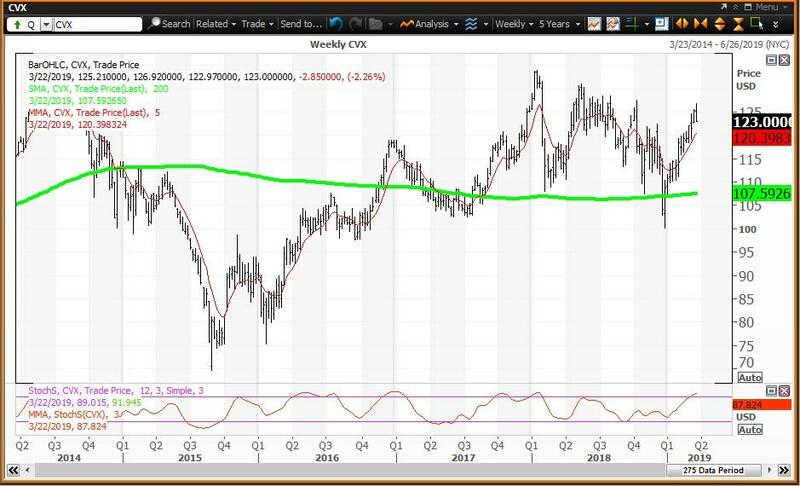 The weekly chart for Chevron is positive but overbought with the stock above its five-week modified moving average of $120.43 and above its 200-week simple moving average or "reversion to the mean" at $107.39. The 12x3x3 weekly slow stochastic reading is projected to rise to 87.98 this week up from 87.23 on March 15. Trading Strategy: Buy weakness to the 200-day simple moving average at $119.00 and reduce holdings on strength to my quarterly risky level at $131.43. 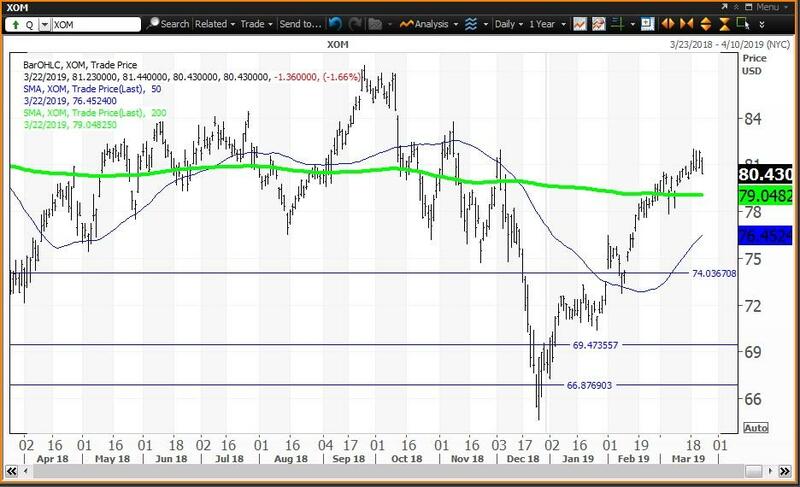 The daily chart shows that Exxon set its 2019 high of $82.00 on March 19. Strength to this level was helped by a "key reversal confirmed on Dec. 26. The low that day was $64.65 with a close of $68.64, above the Dec. 24 high at $67.53, confirming a tradeable "key reversal." The Dec. 31 close of $68.19 was an important input to my proprietary analytics. This resulted in a quarterly value level at $66.87, a semiannual pivot at $69.47 and an annual risky level at $94.26. The close of $79.03 on Feb. 28 was an input to my analytics and generated a monthly value level at $74.03. Note how strength held the semiannual pivot at $69.47 on Jan. 2 through Jan. 4 providing a buying opportunity. A position at the beginning of the year was justified by the dividend and the anticipation of a positive earnings report that was confirmed on Feb. 1. 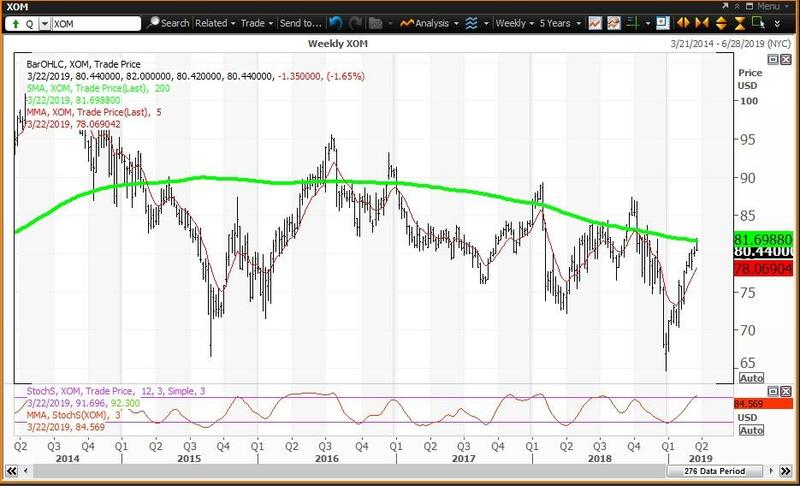 The weekly chart for Exxon Mobil is positive but overbought with the stock above its five-week modified moving average of $78.12. The stock tested its 200-week simple moving average of "reversion to the mean" of $81.70 this week. The 12x3x3 weekly slow stochastic reading is projected to rise to 84.71 this week up from 81.01 with both readings above the overbought threshold of 80.00. Trading Strategy: Buy weakness to the 200-day simple moving average at $79.05 and reduce holdings on strength to the annual risky level at $94.26. Value levels and risky levels are based on the last nine week, monthly, quarterly, semiannual and annual closes. The first set of levels was based on the closes on Dec. 31. The original quarterly, semiannual and annual levels remain in play. The weekly level changes each week; the monthly level was changed at the end of January and February. My theory is that nine years of volatility between closes are enough to assume that all possible bullish or bearish events for the stock are factored in. To capture share price volatility, investors should buy on weakness to a value level and reduce holdings on strength to a risky level. A pivot is a value level or risky level that was violated within its time horizon. Pivots act as magnets that have a high probability of being tested again before its time horizon expires. Disclosure: The author has no positions in any stocks mentioned and no plans to initiate any positions within the next 72 hours.